This guide will go in depth about item level shipping options for eBay listing. To learn about the other item level options, check out our guide here. Item Level Shipping allows you to offer your customers shipping options that differ from your default shipping policy. If you do not do anything to this portion, eBay will simply use the shipping settings you set earlier in the editor as the default for all channels. If you do choose to utilize this feature, you can have between 1 and 5 domestic shipping options and 1 to 5 international shipping options. 1. Shipping Method - This is the first shipping option. By default it will show whatever you standard shipping method is for eBay. Note: even if you want your default you must reselect it, do not leave on “Setting:”. eBay will not recognize options 2-5 if you leave the first under the default setting. 2. Free - true means that shipping with this method will be free, overwriting any value in cost. False means it should check the cost field. 3. Cost - The shipping rate charged to the customer for this method. If the field contains a zero, the shipping charge will be calculated using the weight information entered for the product. 4. Each Additional - This will be the charge for each additional unit of the item ordered after the first, again a zero will let the system calculate the price based on the couriers rates. 5. Surcharge - This is a fee charged on top of the shipping cost. Usually used in combination with calculated, it differs from the handling fee in that it is only for that specific shipping method (handling fee is universal for all methods). 6. Repeat, up to 4 more times. Each line will hold a new option. This section looks very similar to the domestic shipping, but with a few key differences.1. Global Shipping - You will only need to change this if you are using eBay’s Global Shipping Program (you can learn more about that here). If you are participating in this program, you will not use any more of these fields for this item. 2. 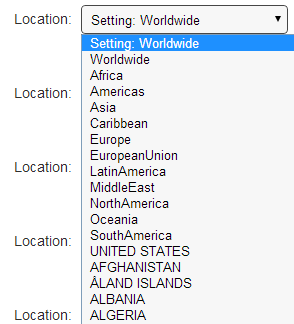 Excludes – Enter the values of any countries or regions you want to exclude shipping to. The list of codes can be found on eBay’s website here: (Countries & Regions). Values are separated by ‘*’ (asterisk). In the above example, this product will not ship to Asia or Australia. 3. This section is exactly like the domestic shipping. Remember that you cannot move to a second option until you have selected a method for number one, even if the method is the same as the default. It cannot be the “Setting:” option. 4. Location: This allows you to select where this shipping option is available. In our example, it is available worldwide, but it can be changed to any region or country. 4. Postal Code & Location - only necessary if you ship from multiple locations. It will tell eBay what location to display on the listing (helps estimate ship times). Only fill out one field, we recommend Postal Code. 5. Handling Fee - if you want to charge a handling fee only to eBay customers, put it here (otherwise put it in Handling Fee field with the rest of the shipping items higher up the page. 1. Returns Accepted: will you accept returns for this item? 2. Within: if so, what is the maximum number of days after purchase that the item can be returned? 3. For: money back refund only? Or will you offer and exchange/replacement option? 4. Who pays the return shipping? 5. Will there be a restocking fee? If left blank, no restocking fee will be assed.